There are more stories coming out of Fev than I can keep up with. You might remember Fev from last year. 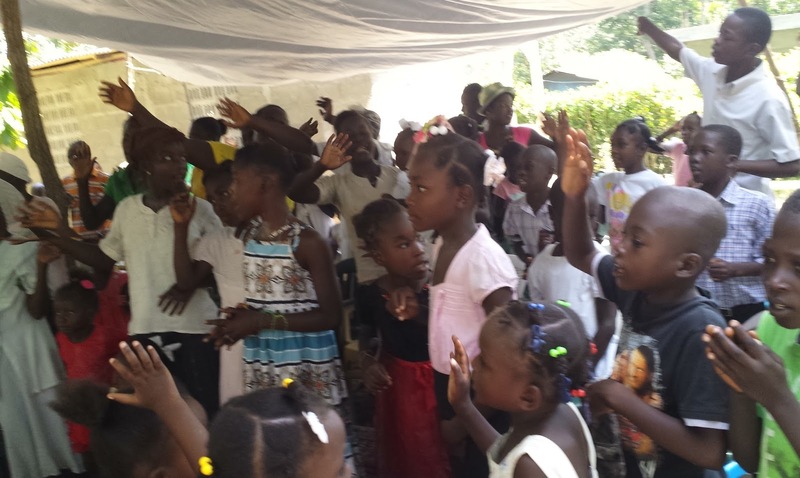 In an effort to take the Gospel places it has never been in Northern Haiti, Junior and a group of first year students came across Fev following their missiology class. Full of temples (five, to be exact) dedicated to darkness and completely void of His church, they started to share the Gospel in homes and yards throughout Fev and found that many...most...had never heard the name of Jesus. NONE knew Him. Raising funds on their own for transportation, the Missions Class started going 2 and 3 times a week, storytelling the Bible and seeing men, women and children coming to Christ--and HUNGRY for more. A year later and after much prayer and seeking, Walnique (graduate of 2015) was chosen (and felt called) to lead the discipleship effort, and a regular set of students join him in teaching, Bible study, pastoral care, etc. New believers and interested community members meet throughout the week with students, and now on Sunday mornings as well they meet in plastic chairs, on tree roots and homemade benches, with students leading worship, taking turns with Walnique preaching, etc. To stay away from all the negative ideas that terms and buildings and tradition and pastors tend to bring to "church" in Haiti, Fev is just an ever-growing group of new Christ-followers, wanting to know Him more, being discipled and served by a community of EBS Christ-followers. There's no dress code, there's no money, there's no building, there's no pastor, there are no membership cards. You can now imagine why there are more stories than I can keep up with. The hardest part of Fev, for me, is that I have never been there. And you know me. I want to BE there. I want to tell the stories as I see them...want to hear the testimonies from the back row (if there was one) for myself...want to share with you MY experience. Want to pick up on all the little things that no one thinks to tell you. And I think I'll get my chance. But for now, even more than I want to be there, I want to not mess anything up. And when foreigners step in, even quietly, even in the background...things often get weird. When a person of power (which I can't help but be seen as as a foreigner) appears, priorities have been known to quickly change. Suddenly, the witch doctor who is miraculously offering to GIVE Junior and the students a small piece of land to meet on would strangely decide he wants a thousand dollars for it. Suddenly, the people who are asking for more of Jesus start wondering if they need more of something else, too. No matter what we wear, no matter how we arrive, no matter what I say or don't say, I've seen just the knowledge that there is a foreigner in the background change the foreground. And the purity with which He is being given, and received, and pursued at Fev continues to make me pause and wait and stay back. I do not want to mess anything up, as terribly as I want to BE there. So here is today's story, from one who only hears, with pictures, from one who did not take them...trusting that when the time is right, I'll share for myself! When June and a group of first year students first started going to Fev, they couldn't help but be heavily aware of how strongly voodoo was practiced in the village. Five different temples seemed to define Fev, leading people in how to live, what to do with sickness, how to deal with revenge, what to believe about nature, how to appeal to different spirits and demons. One such witchdoctor has a wife and two daughters, and Junior noted immediately that the daughters seemed soft to what he was sharing. After returning to share the Gospel with Fev dozens of times, first one sister, and then the other came to follow Jesus. Of course, following Jesus also means NOT following whatever you were following before, which for Dieula (meaning God is Here), was stopping customs that had been a part of her life since always. One of these customs is called manje naissance, which is the practice of offering to the demons sacrifices in exchange for favor, especially on your birthday or at the start of the new year or before a major event. Every year as the girls started a new school year, their mother would send them to feed the lwa, the spirits, hoping for a good year. However, this year at the start of September when mother brought Dieula food and gifts to give over to darkness in hopes of a successful year at school, she refused. Dieula claimed that Jesus would care for her this year, infuriating her mother. Her little sister did the same, upsetting both parents. Finally, her mother gave up trying to force them...and refused to pay for their school this year, noting that they could sit at home and think about this newfound foolishness in their lives. "Let your God send you to school then." Two weeks after school started, Junior found Dieula looking glum and home in the middle of the day, and as he pressed, she shared her story with him, noting that even if she never was able to go to school again, she was not going back to the old ways. She would not be giving one more thing to Satan, no matter what. Junior prayed with her and encouraged her to continue to trust in the Living God. After Bible study he came home and shared with a bunch of the students her story. This isn't about our students, but I cannot overemphasize the financial poverty of the large majority of our student body. It is by the help of many, extremely low tuition, lots of scholarships and a whole lot of His Provision that most of our students are able to be here....95% working in the work study program because the $100/semester room and board is too far out of reach...scraping together what they owe through payment plans and a lot of support from their churches and communities. And yet these same students (without asking for a penny from EBS or from us) are now sending both Dieula and her sister to school. Entirely. "God will provide" Dieula had told her mother confidently of her new God when her parents had withdrawn their support. I love dreaming about the the ways Fev is seeing the works of a Hand they never knew before. I love imagining the confusion and surprise Diuela's parents are currently living in...trying to understand how a Living God through His children is somehow sending her daughters to school. Without demanding sacrifices. With nothing in exchange. I love thinking about the girls loading up their bags each morning, seeing that the God they are learning to trust is worthy. Is able. I love seeing our students give, give. I love His grace to use them to do His work, to be His body. And I love knowing that He is not finished.